A trip to Purgatory is devilishly delicious. In a conservative, largely religious state like ours, it takes balls to open a business called Purgatory. But then, the "Welcome to Purgatory" sign that welcomes visitors to the bar isn't really aimed at those folks anyway: This is a bar, not a restaurant, the now legally required signage states. That means you can wander into Purgatory—the bar, not the state of suffering inhabited by the souls of sinners—and enjoy a beer, glass of wine or cocktail without having to purchase food. You'll want to order food here, though. It's elevated bar cuisine that's popping up more and more at places like Whiskey Street, Under Current, Copper Common and Bourbon House. 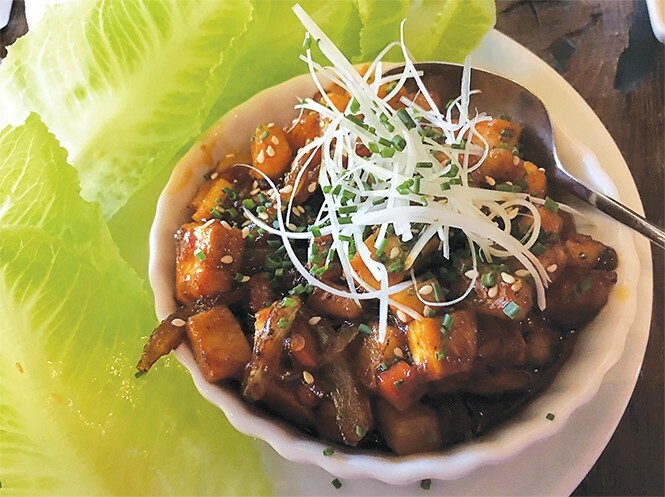 Purgatory comes from Sapa owner Mai Nguyen, who has never shied away from cutting-edge. As with Sapa, she seems to have spared no expense in decking Purgatory out. It's not fancy—there's a wall-length mural of netherworld characters bellying up to a bar in Limbo—but its design features, from the bar itself to the restrooms, are all first-rate. The glass wall opposite the bar opens onto an inviting patio that's great for warm weather. Aside from the design and décor, the cuisine is innovative, as well. We'll get to that soon, but first, let's peruse the drink list. Beer aficionados are going to love drinking here. The beer list is one of the more extensive in town, with some 17 IPAs alone and seven "beertails." The wine selection is another story—unless you consider two reds and one white a "selection." How could I resist a house cocktail called Champagne Ho's? The drink arrives deconstructed: a Champagne glass with pink and blue cotton candy puffs inside, along with a decanter holding a mixture of Champagne, yellow Chartreuse, lemon juice, rhubarb bitters and grapefruit juice. When I poured the liquid into the glass, the cotton candy dissolved, turning the cocktail a sort of gun-metal blue. It's a sweet drink, and one I thoroughly enjoyed. Less enjoyable was a Tijuana Fog, a mélange of Lunazul tequila, mezcal, lemon, egg white and lavender—the latter of which overpowered the drink with its fragrance and flavor. As for the menu, this is not your daddy's bar food—unless, that is, your pop was used to eating things like pork belly nigiri ($6), watermelon poke ($7) or a protein salad of tomato, carrots, chickpeas, quinoa, cucumber, dill, beet hummus, herbs and yuzu vinaigrette ($7). My wife and I really enjoyed the nearly incendiary heat of the spicy chicken ssam ($6), which is a DIY lettuce wrap with a red chile-powered mix of chicken, leek, jicama and carrot morsels. The fresh, tender lettuce provided a cooling effect. There's a large french fry selection—some eight or so—featuring different toppings and seasonings. There's nothing special about the fries themselves, though; they taste like wholesale distributor fries from a bag. But the accoutrements are unique—ranging from versions like nacho and Buffalo to K-Pop fries, curry, enchilada and rosemary. We very much liked the Japanese fries ($7), where are thin-cut and smothered with shiso crema, dashi, tobiko, strips of nori, pickled onions and herbs. The wife's Baja Bowl ($9) was outstanding. It's literally a burger in a bowl—in this case, a housemade black-bean burger covered with pickled red onion, enchilada sauce, rice, cilantro, lettuce, tomato, scallions, shredded cheese and a fried egg. For those looking for something a bit more mainstream, I'd recommend the mozzarella/Parmesan/crema cheese sandwich ($6); it's one of the best grilled cheeses in town. Purgatory is the perfect spot for foodies, libation lovers ... and, yes, sinners too.